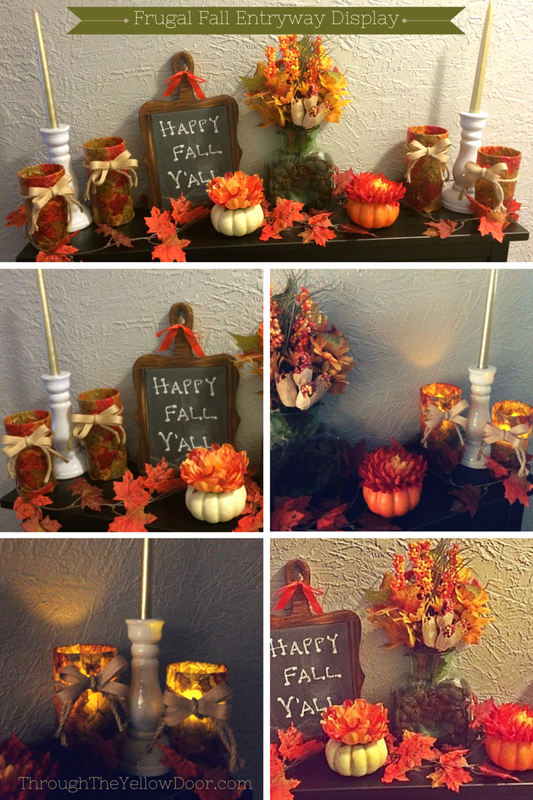 I finished putting together our Fall entryway display last night and I love it! 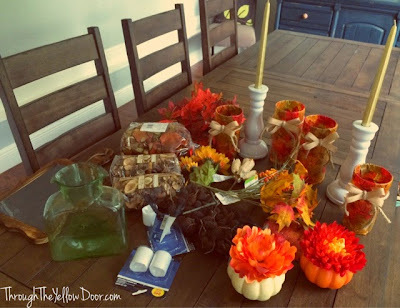 I used a few things I already had around the house, but everything else was from the Dollar Store and Target clearance bins. I'm quite proud of my thriftiness with this project (something I'm trying hard at lately) and in total, I spent less than $20 putting this entire display together! 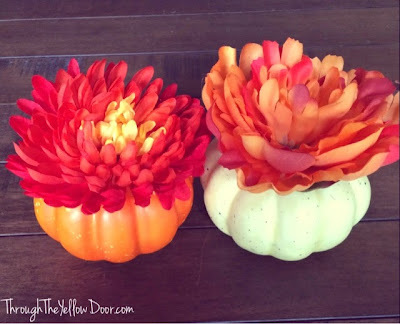 First things first, I had to work on the Fall leaf "candles" before I could do anything. Check out the tutorial for those here. 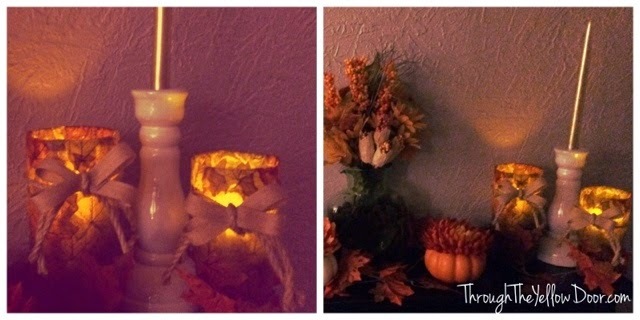 Once I had the "candles" complete, I gathered the rest of my supplies and started messing around with ideas. I usually have this beautiful vase sitting on our sofa table collecting dust, but I knew I wanted to include it, so I decided to fill it with some leftover mini pinecones from last Fall. 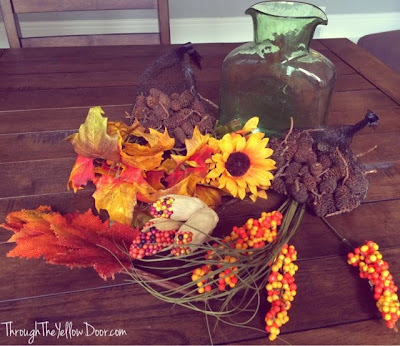 After it was filled with pinecones I placed the Fall flowers I purchased at the Dollar Store. I also picked up some Fall leave vine-type things, to drape around the entire display. 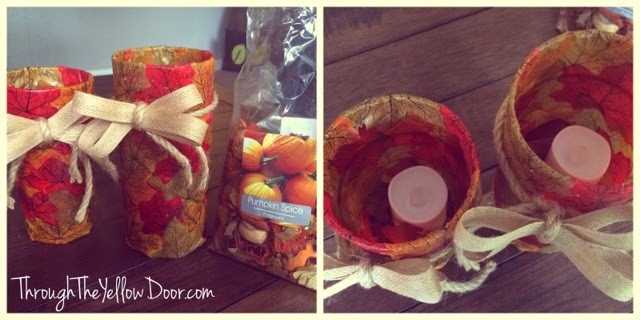 Next, I added pumpkin spice potpourri to the DIY "candles". I filled them about halfway with the potpourri and then added the battery operated candle on top. This way, the candles will have a nice Fall scent even though they aren't real candles; Win! 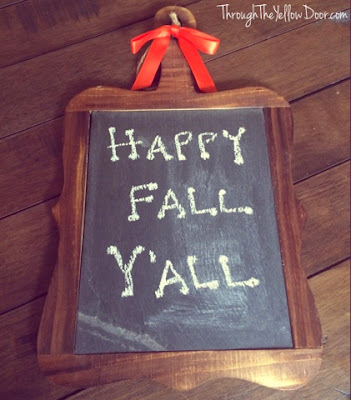 Then, I wrote an friendly Fall saying on my existing chalkboard (isn't this thing the cutest by the way?! I picked it up last year when I had more spending cash on hand at Michael's and I'm sure they still have similar ones). 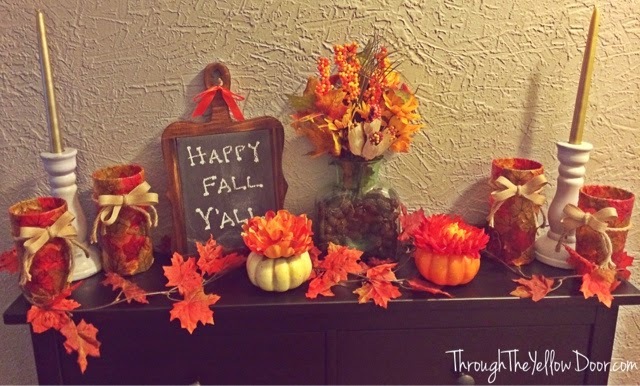 I went with "Happy Fall Y'all" as my saying because it's adorable and we're in the South, so why not?! 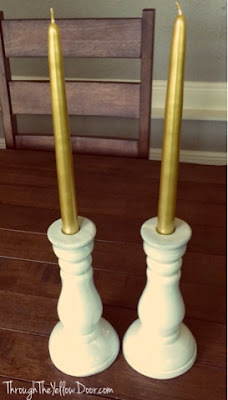 I knew I wanted to include these Italian white candle holders I received from real Italians (my sister-in-law and her family live in Rome) in my display, so I picked up some gold candles from the Target clearance bin. And speaking of the Target clearance bin, these freaking adorable mini pumpkins were my biggest "splurge", they were $3.99 each. 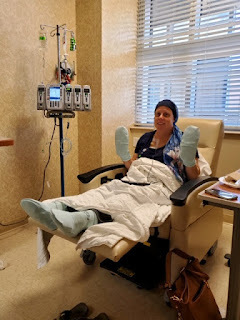 But, so worth it! Finally, it was time to put everything together and come up with a display! Here it is in the morning sun, well kind of morning sun, it's actually quite cloudy here today (appropriately Fall-like). And here are some pics of the "candles" glowing at night! As I said, overall I adore this display! I can't wait to change it up slightly for Halloween and then for Thanksgiving, but these pieces will probably still all be included!! 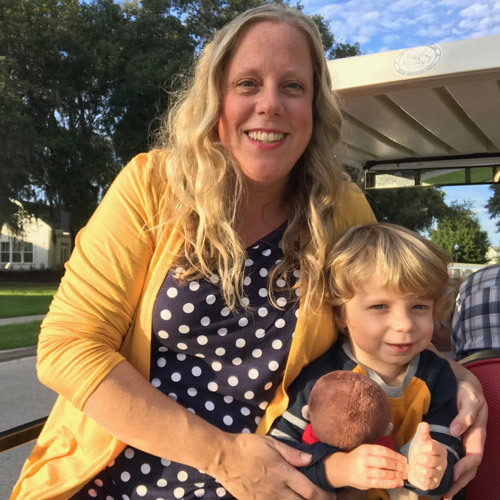 Thank you for joining in with Frugal Family Challenge - your display was so pretty it was featured as link of the week this week. Please do pop back to link up again soon!